The Skinny: A terrific film from director Kinji Fukasaku. Shockingly powerful, technically excellent and possessing of enough thrills to satisfy the exploitation fan. This is a keeper. by Kozo: The following review and commentary were written by Lee Wong before his passing this past year. Originally his writing was a mixture of both pieces, and was deemed somewhat rambling by both he and I. It was then decided that I could write a review, and he could do the commentary. by LunaSea: As Kinji Fukasaku's film begins, we see TV cameras frantically trying to capture the winner of the last Battle Royale, a plan advised by Japan to combat youth violence. A bloody young girl looks up with a menacing, disturbing grin on her face, preparing us for what's to come. Looking at the premise of such a filmat least on the surfaceyou might expect to see a gory exploitation thriller trying to spoof and critique the worldwide craze for reality TV. However, this film is much, much more. In the world of Battle Royale, Japan has reached a 15% unemployment rate. Faith in society and the school system has been lost, and kids have rebelled by choosing not to attend. They no longer respect adults or their teachers. It's because of this widening gap that the adults have enacted the BR Act, which stipulates that one randomly chosen ninth grade class be sent to a remote island for a three day game. They're each given a map, food, a random weapon (anything from a pot lid to a gun) and an explosive collar. That collar will detonate if removed, or if the kids attempt to flee. Occasionally "hot zones" are created, which will detonate your collar if you happen to be in them at the improper time. And, at the end of three days, if more than one student is left, everyone dies. It's kill or be killed, survival of the fittest. It's just like school, or modern society. Battle Royale is based on a novel which presented this not-so-alternate world, and explored the motivations of the kids and the adults. However, instead of translating the book's exposition, Fukasaku decided to just let the characters speak for themselves. Having more social commentary could have been interesting, but it might have made the film heavy handed, and possibly even ruined it. By communicating his vision via storytelling and character development, Fukasaku has made the film better than one would expect. He adds a lot of black humour, as many deaths are overly-dramatic and almost cheesy, but once you get accustomed to the world, the film begins to dig deeper. Ultimately, the film offers some strong themes and raw, unflinching power. From what could have been a simple game of sparring cats and dogs, Fukasaku transitions into a reflection on the idea of teamwork, which once was the foundation of Japanese society. Over time, such teamwork has shattered under pressure, and longtime friendship has vanished from the fear of trusting others. The most powerful scenes of the film involve students trying to form a team and then failing as their trust dissolves due to fear and insecurity. In the final act of the film, Fukasaku seems to suggest that the only way to overcome your troubles is to trust someone wholeheartedly, and to try and solve problems together. He also seems to encourage today's youth to "run for it," to be confident and believe in themselves. This is a message that applies to the society of Battle Royale, modern Japan or even anywhere else. Fukasaku's double-edged direction is much appreciated: he certainly doesn't hold back anything in terms of violence, but he's rather subtle in other ways. Teacher and BR Act taskmaster Kitano (Takeshi Kitano) has his own problems, which are as telling as the plight of the kids, and equally as relevant. Fukasaku deals with heavy themes, but never lets his social commentary overwhelm the action aspects. You could approach this film as unadulterated, albeit dark, fun and the film delivers. The dramatic sequences are not over-emphasized, and if they are then Fukasaku is poking fun at them. As a result, the film never feels manipulative or eager-to-please. Battle Royale also features a great deal of suspense, and uses death toll alerts in much the same way that High Noon used the clock on the wall. In that film, the clock paced the film perfectly up until the final battle, and the roll call of the dead achieves the same thing in Battle Royale. This is clearly more of a director's film than an actor-driven one, but many of the teenagers offer solid performances, even when their characters ask for emotional restraint. Takeshi Kitano is magnificent as usual, and Masanobu Ando is fine as the psychotic outsider who never speaks. The film has a brilliant soundtrack as well, using famous classical pieces that evoke the work of John Woo and even Stanley Kubrick. And while the violence is certainly graphic and shocking, it feels right given the circumstances. by LunaSea: Kinji Fukasaku, one of the most underappreciated directors from Japan, has been shooting controversial, dark and shocking films for over four decades. His primary genre has been the gangster film, though he's occasionally journeyed to other genres such as musicals or science fiction. His past works changed the way gangster movies were done. Instead of using gangsters as a tool to tell a story, he explored the reasons behind the actions his characters took. Quite often, his characters were a product of their times, and not simply genre types. His work from the sixties and seventies criticized Japan's post WWII rebuilding, which benefited only certain sectors of the population but also made many people so poor they lost hope. Japan simply tried to force the poor out of this new society. And, by maintaining that most problems could be solved with the easy dogma and promise of democracy, Japan relegated the weak to the darker sides of society. Japan forced the people into poverty which in return generated crime. 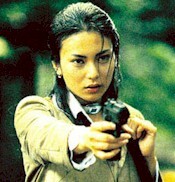 Gone was the Yakuza code of honor, which is still glamorized to this day in films across Asia. Fukasaku's penchant for social commentary doesn't seem to dissipate with Battle Royale. Here, he explores the consequences for the generation that rebuilt Japan in the seventies, but also experienced the bubble economy crash of the nineties. Many people have pointed out that Battle Royale is a film about Japan's present youth, but it covers much more than that. The film explores the generation gap between today's youth with the youth of the seventies, and the two completely different worlds they inhabit. The confidence that led Japan to the top is no more, and nowadays studying and excelling in the best schools doesn't guarantee you a job. For that reason and many others, the adults of today are dissatisfied by how their lives have turned out, and have lost confidencean integral part of Fukasaku's message. Try to ask yourself why he paints such an apocalyptic demise for Japan's current youth. He criticizes adults for trying to educate their kids the way their parents educated them, a formula which obviously no longer works, in Japan and perhaps anywhere else. Their generation tried to suppress any kind of rebellion with the hope of democracy, but instead the role of the familyas well as authority and societyall changed.